Bihar floods is something to be called beyond disaster. Already 305 people have lost their lives and 1.26 crore people are homeless. The population is almost equal to the population of entire state of Arunachal Pradesh. The before flood life in Bihar was already below normal standards of living and with the recent floods, situations have worsened beyond imagination. 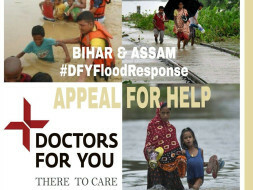 Being an organisation of medical practitioners Doctors For You is responding to the flood affected districts of Bettia & Araria. Assam already has highest number of internally displaced people in the whole world and current floods have worsened the situation. Already 154 lives are lost. We request all the individuals to extend their helping hands so we can support the flood victims. With villages submerged in water and 1.26 crore people on roads, the health challenges have increased and there are risks of epidemic. The health services in Bihar were already not accessible for everyone and current scenario has worsened it and situation is likely to get worse once the water recedes leaving behind debris which would lead to communicable diseases and health problems specially for pregnant women, lactating mother, elderly people, differently able people and children. The WASH concerns are also alarming with no access to clean drinking water and increasing chances of diarrhea and cholera outbreak. The Doctors for you team is responding towards the accessibility of primary health care and Water, sanitation & hygiene services. No amount is small, even an amount of 500 can provide clean delivery kit for a pregnant female and save two lives or an amount of 435 INR Can provide dignity kit to a female. Objective 1: To provide primary health care and reproductive health care services in the selected areas of the affected districts. To organize health camps in the selected areas. To cater to the reproductive health needs of the pregnant women in selected areas through ANC check-ups, supply of clean delivery kits, medicines related to reproductive health and others. Objective 2: To provide Water, Sanitation and Hygiene services and sensitization on WASH among the affected population in the selected areas of the affected districts. To distribute WASH hygiene kits and bleaching powder to the flood-affected population. To distribute dignity kits to all adolescent girls and women in reproductive age group. Awareness programs on hygiene promotion.